'x' Things You Probably Didn't Know About...: Trivia about artists. By The Numbers: Gregory J Rumburg. 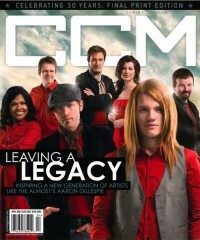 Industrybeat: Christian music industry interviews, by Jay Swartzendruber. Outta Toon: Comic by Rick Baldwin. Perspectives: Commentary by Bob Larson on culture and music. Sound Advice: Commentary by John Fischer on culture and music. The Final Word: Commentary by Louie Giglio. The Writer's Block: Matthew West. Trend Watch: Trends in Christian music, by Beau Black. August 1979 in CCM "News Item: CCM Canadian Distribution Set"
September 1996 in Religious Broadcasting "Letters to the Editor: CCM, trademark on term "CCM""
July 1998 in CBA Marketplace "News Item: CCM Celebrates 20th Anniversary"
July 2003 in CCM "fyInfo: You've Come A Long Way"